How does Linux stack up against Microsoft's latest champion? 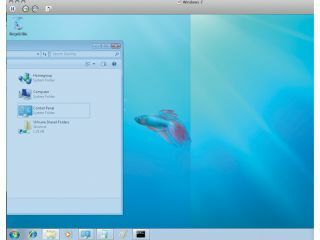 The 'new' Show Desktop feature in Windows 7 is identical to functionality in Gnome and OS X. Do keep up chaps! Microsoft's Windows 7 release date is 22 October, less than three years after the release of Windows Vista. And since the Windows 7 Release Candidate has been made available free, Linux Format magazine couldn't resist pitting Windows 7 against the current crop of Linux features. This article isn't designed to ignite further flame wars on which is better or worse - it's about understanding the market and understanding the competition. Microsoft Windows is by far the most dominant operating system on the planet, and Linux users, need to keep on top of new developments, new technologies and new ideas. This gives Linux the best possible chance to grow and remain relevant. Both operating systems now occupy a distinctly different part of the market. Microsoft has taken Windows down a purely proprietary route, forging relationships with content providers and hardware vendors that keep full control from the user. Linux is completely open. Out of the box, Linux even boasts better media format support than Windows, and it can be the only way to run older hardware at its fullest potential, especially if there isn't a new driver for Windows 7. Over the life span of Windows 7, public concern for privacy, digital rights management and locked-in upgrades should help Linux to grow as an alternative when users want to keep complete control over their own hardware and software. Microsoft is now operating in a considerably different, and more technologically aware, environment than nine years ago when Windows XP was released. The European Commission has spent a lot of time, effort and money hounding Microsoft for its alleged anti-competitive behaviour and this is going to have an impact on Windows 7 in Europe, as well as the user's awareness of the issues surrounding choice and bundling. Many average Windows users, for instance, were unaware that Internet Explorer was only one option for browsing the world wide web. Thanks to the European Commission, when Windows 7 is released in Europe it won't feature any browser at all, and for the first time, Windows users will have to make a choice about what they want to install. And making choices can get addictive.